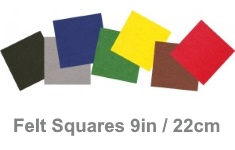 30% wool felt, available in range of sizes and colours. Made from premium quality 300 gram, 30% wool / 70% viscose mix handicraft felt, which has a lovely soft feel and is great to work with. Due to the wool content, it has a nice matt finish and is free from the (not very nice) 'squeaky' feel you get with all synthetic felt.